This month's socks from stash are the Gentleman's socks with Lozenge pattern from "Knitting Vintage Socks" for my First Love. I am using Sunbeam St Ives from the stash: I bought ten balls in a batch on Ebay over a year ago when I heard this yarn was being discontinued. I think it was a false rumour as it still seems to be available! At first I thought this yarn was a bit scratchy, but the first pair I knitted have softened a lot in the wash and are wearing really well. 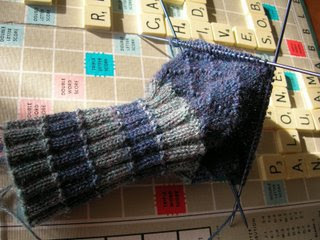 FL has worn holes in his pure merino socks (sob!) so this is a project of necessity. I am making slow progress with the size 0 (2mm) needles, but love the attention to detail in this pattern - like all of Nancy Bush's! This is the first time I have used metal Boye's needles and I am pleasantly surprised - lovely smooth tips instead of splitty wood are definitely the way to go with such a tight gauge. Those are beautiful! I love the pattern. Even my plain-black-only-socks husband would find it hard not to love these, I think! Very nice.